COX'S BAZAAR: Upon entering a makeshift camp in Balukhali, Bangladesh, one is reminded of an animal farm. Rows and rows of barns and gunny sacks dot the area which now houses thousands of Rohingya refugees, who have been internally displaced since the crisis began in 2011. The place turned noisy as Malaysian volunteers arrive on a bus, accompanied by local military. Our arrival attracted the refugees, some were smiling while others scrambled on their feet to be the first to know what was happening. Their appearances untidy, sarong up above their knees, unruly hair and red-toothed as a sign of constant betel nut chewing. When you look at them closely, their eyes tell a story. A story of misery and sadness. “Haipp!!!! Haippp!! !” … An army officer yelled trying to keep the refugees away from the Food Flotilla for Myanmar entourage. The entourage is made up of 25 volunteers comprising volunteers and media personnel, who had to walk for three kilometres to reach the newly-built refugee camp. Upon arriving at the location, we saw several barns lining the sparse area until the foot of a hill which had been flattened. My eyes were fixed on a boy, who was looking at the ‘commotion’ from afar. Dressed in an orange T-shirt and a brown sarong stained with mud, the boy scrambled on their feet to get the goodies distributed by the Malaysian volunteers. “Tomar naam kee? (What is your name? ),” asked Miejanurrahman, a volunteer from the International of Migration. “Muhammad Arafat Hussein!” the boy replied briefly. The 11-year-old boy looked fearful, as he stood beside the row of ‘houses’ with dark plastics and sticks that function as cooling effect. We tried to converse about his experience in obtaining an asylum in Bangladesh. “I came with my parents and four of my siblings. Previously, we were placed at a village near Maung Daw, Myanmar. “My brother had been apprehended by the Myanmar military, I haven’t seen him until today,” said Arafat, as he sucked on the sweets that he got from the Malaysian volunteers. 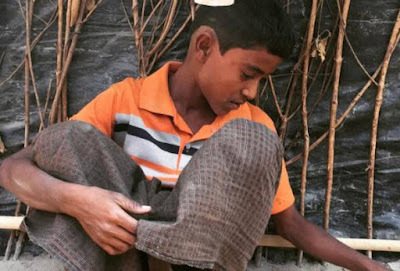 According to UNHCR report, an approximate 20,000 Rohingya refugees have yet to receive formal education since 2010. Arafat is one of children, his child instinct is distorted due to his sufferings. When asked about his ambition and hope, Arafat seemed clueless, he did not understand these words although they were conveyed to him in native language. His eyes blinked rapidly, he looked as though he was looking for the best answer. Almost a minute late, Arafat started talking. “I want to be in a position with sufficient salary for survival,” said Arafat. The Rohingya refugee camp located in Balukhali, Ukhiya was built 45 days ago. To date, it houses some 5,000 refugees whose hopes to receive constant aides for survival.